The first test of JYC blogging on the fly. Hopefully the Blogger app will prove successful....then there might be some hope of me actually getting some way through JYC this year! So, to start with. 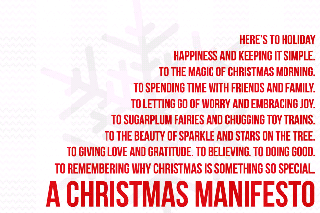 A Christmas manifesto. I've been a little lazy for sure and stolen Shimelle's premade one, but really it does actually sum up what I'm hoping for from this Christmas. I really want to try to get into a proper festive mood and to just relax and enjoy the season. To make it as magical for the kids as possible. To let go of the stress and be a fun Mum for a change instead of one who is cranky and busy all the time. I just want to kick back and enjoy the Christmas tree scented, minced pie flavored, holly berry coloured, wrapping paper covered ride! I'm hoping to find the fun Mum in me, too :) I know she's still in there somewhere . . .